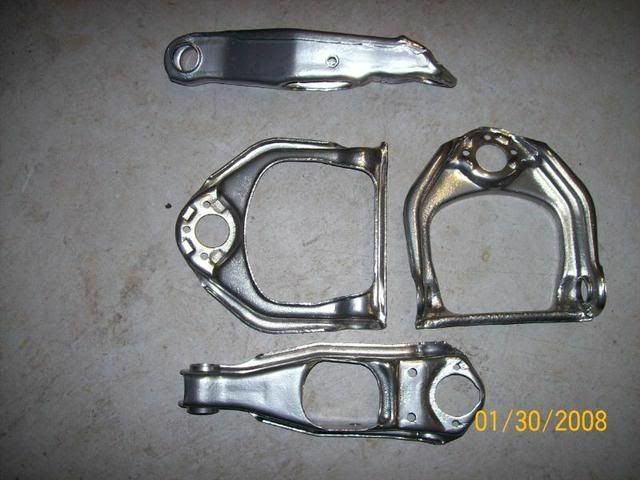 I have a question, I was hopeing u could help i am new to powdercoating and about to powdercoat my motorcycle frame. 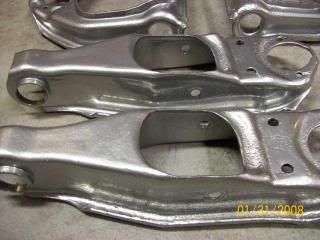 I was wondering do u have to take off the anadizing that is on the frame before u powdercoat or can u leave it on. No you don't need to remove the ano, it's a good base for powder. If you feel more comfortable removing it, it should blast off pretty easy. Are you sure it's anodized? If you are going to use Extreme Chrome and Super High Gloss clear, go to the Powder Coating forum and get the Sticky instructions on how to use this type. The outcome is super. 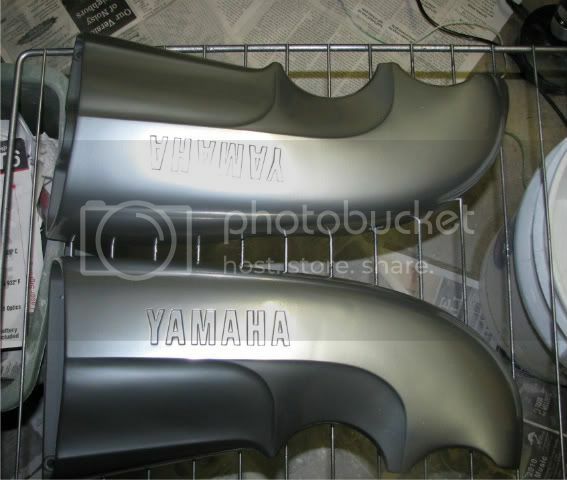 The 2 Images attached are done with extreme chrome and super high gloss clear coat. Image 0506 has teh clear coat on it..
Now the How To Part of this post.. Apply Chrome as normal BUT applying only enought to coat and not over coat you want a good thin layer. Now Cure at 375 for 30 mins, yes this is after it has come up to that temp ( the part not the oven ). After curing let part(s) cool to room temp this is very important that it is room temp!!! Now reheat part to 150 degree's +/- 10% remove from oven then clear coat for the required time, No more no less. So far I have used over a pound of powder each and have turned out the same results each and ever time.. With very very little to no cloud effect.. Thanks for the tips! This is a learning curve for me I've done a bout a dozen or so Xtreme chrome pieces & with your process it seemed to work the best....Here's an intake I did for a friend with xtreme chrome & then cleared. It'd be nice if there were a way to clear without any added dullness, but I am really happy with the result. They are shinier than they look in the second pic. Interesting how you got that dull finish. When I saw the pictures I thought you used a satin clear on top... but by your comment, it sounds like you didn't. What level of gloss did the clear say it was? could it be under-cured? I read somewhere about laying down a black base coat before the extreme chrome. I've been searching the forums and google but I cannot find where I originally read it. I have several parts I'm doing for a friend on his Eclipse motor he's currently building. 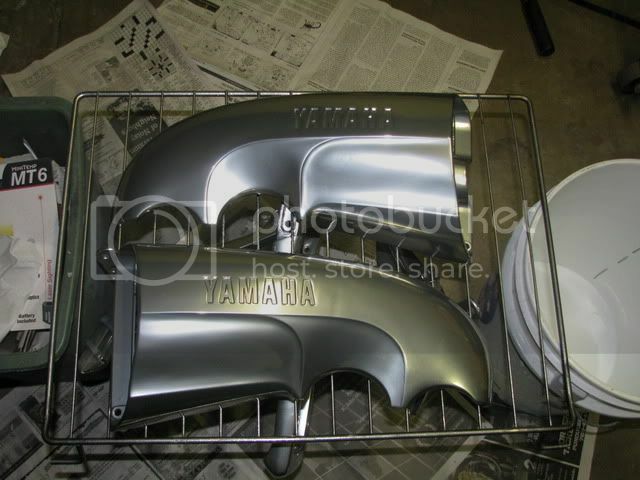 I showed him a piece I did in extreme chrome and he wants all his parts done in this color. I read the sticky on applying extreme chrome and I have all the parts prepped and ready for powder. However, if the black base gives a better quality I definitely would like to go that route. Has anyone ever done this? Is there a noticeable difference? I'm only doing the extreme chrome with clear coat, no candies, ect. I would think the black base would darken the chrome, but I could be wrong. I'd like to ask for any advice you guys may have. If the extreme chrome over a black base gives a better quality finish I'm all for it. I don't really have enough powder to be experimenting to see what happens so I figured I'd ask you guys what you think. Any info would greatly be appreciated. Should it be a gloss black or flat black? And if so, should I let the black base partial cure before applying the extreme chrome or let it cool to room temp. before the chrome? I would like to know where to buy the Extreme Chrome and clear coat ... who makes/sells it? Thanks. Extreme Chrome was a Tiger Drylac product, it has been discontinued and replaced by Ultra Chrome. I was just messing around and mixed the chrome and clear together about 60 chrome 40 clear and it looked great and DIDNT LOSE the bright shine. try it. let me know how it works for you guys.